Sometimes, crossing a state line is no big deal…the first mile of a new state doesn’t look much different from the last mile of the state you left. Other times, however, you cross a state line and suddenly FEEL as though you are someplace new and different. That’s exactly how we felt when we crossed into Wyoming. This wide open landscape and this wonderful welcome sign made us excited for the next leg of our adventure. 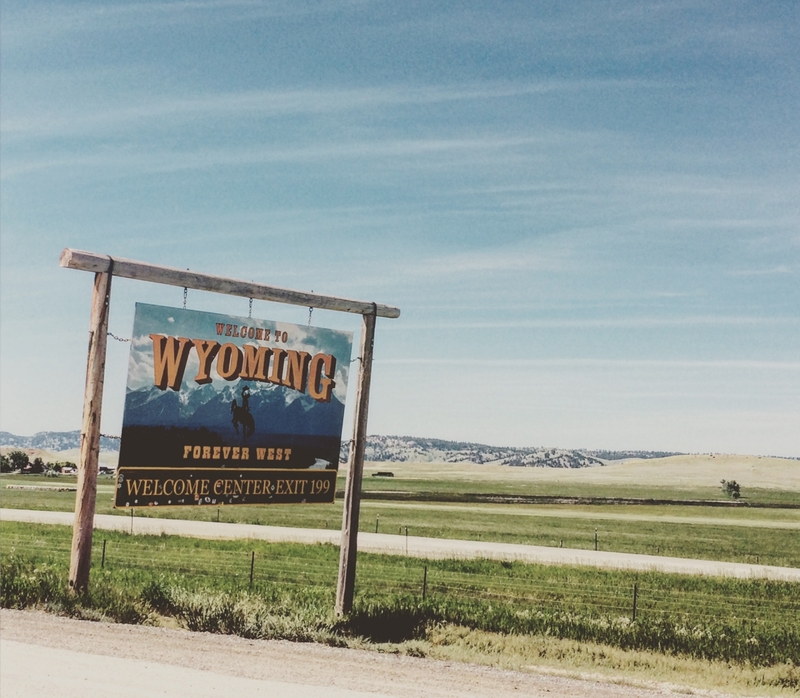 If you cross into Wyoming on Interstate 90, be sure to stop at the Northeast Welcome Center. It’s housed in a beautiful building and provides a great place to talk with a helpful person, learn about the region, and pick up maps/brochures. This center has some amazing photo ops. Even our big boys channelled their inner cowboy. Yee-haw!! 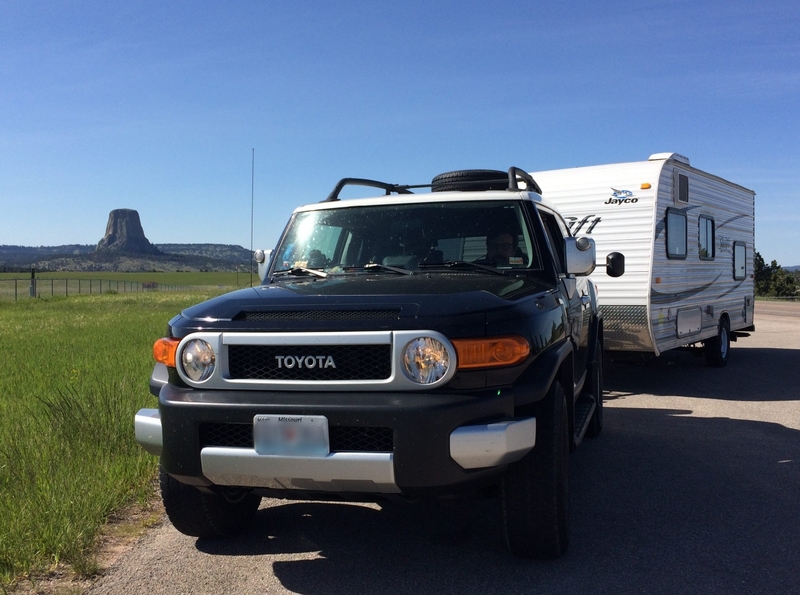 We turned off the interstate to begin our trek to Devils Tower National Monument. 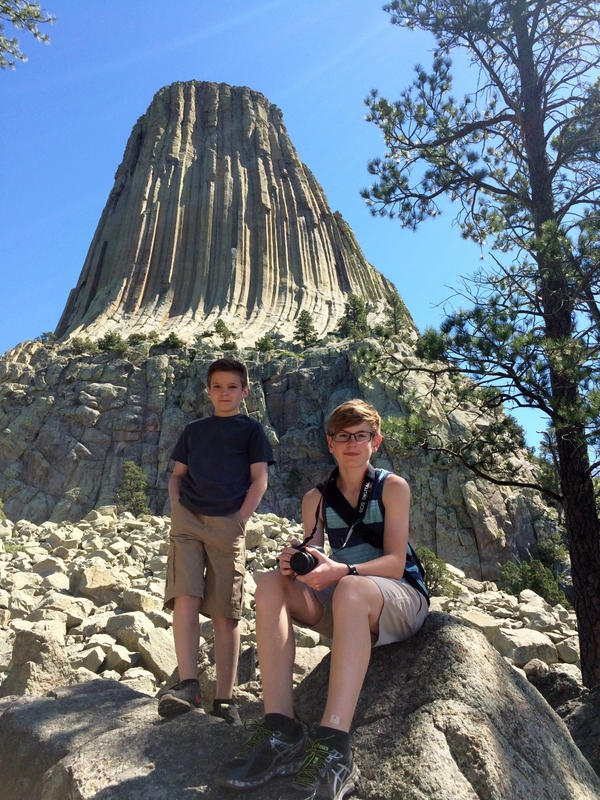 In 1906, Devils Tower became America’s first national monument. We were excited to see it on our Birdy NPS 100 road trip, which would also take us to America’s first national park (Yellowstone). 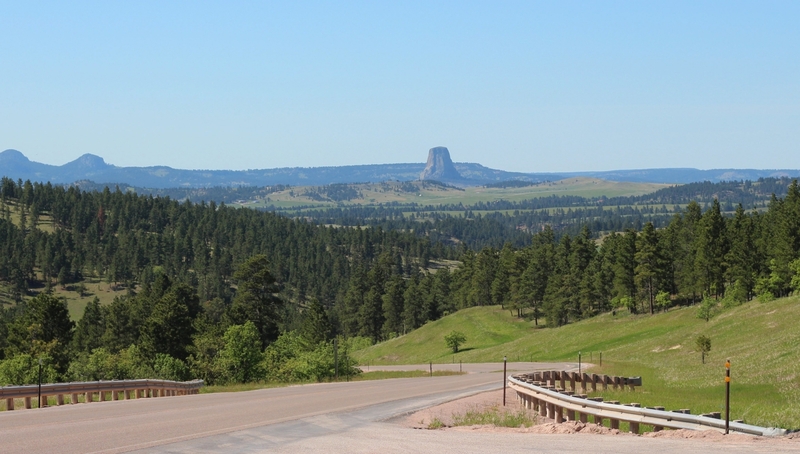 Even from afar, the Devils Tower is a site to behold as it boldly rises 867 feet above the surrounding landscape. If it were a skyscraper, it could have as many as 60-70 floors. For centuries, this geological wonder has drawn people to it, and many Native American tribes consider it a sacred spot. As we got closer, we enjoyed the spectacular beauty of the landscape. 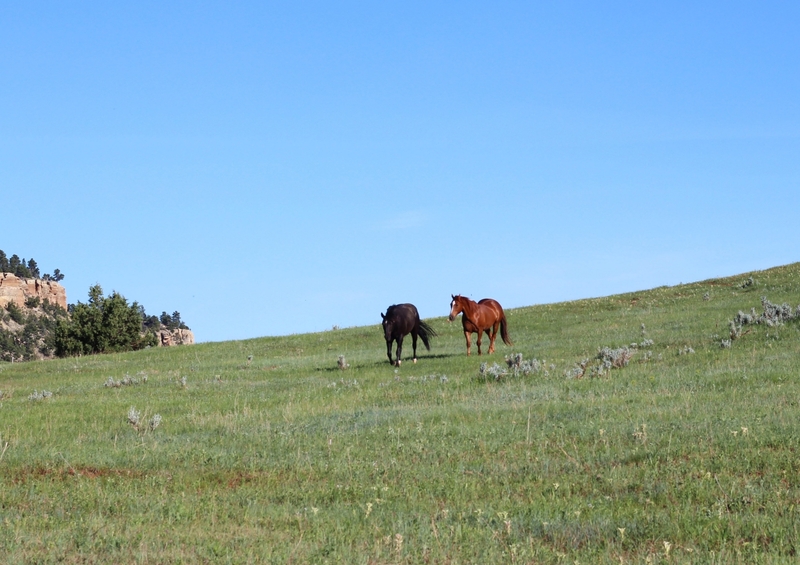 Alice Walker once titled a collection of poetry Horses Make a Landscape Look More Beautiful. Isn’t that so very true? After the highway dropped into the river valley, we suddenly arrived at the entrance to the park. We set up camp at the Devils Tower KOA (review coming soon) and made plans to explore the next day. 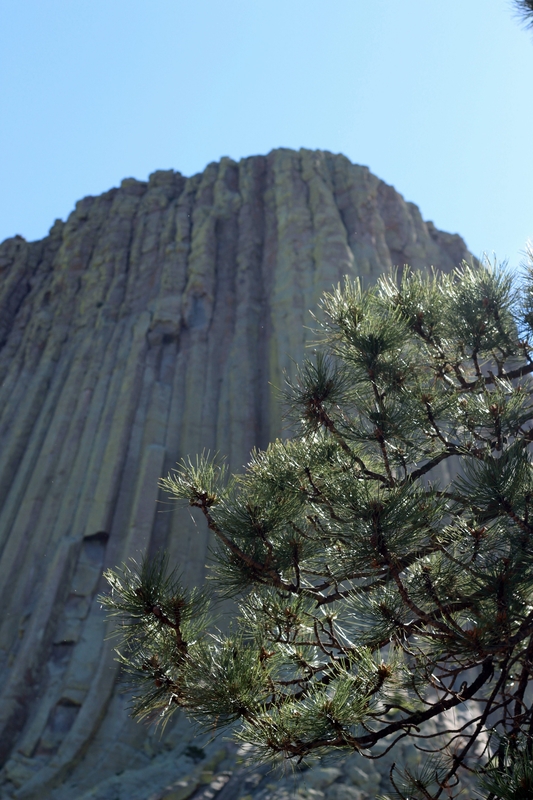 Devils Tower National Monument is a very small park, consisting of the tower itself, a small visitors center, and several trails. We stopped to learn about the park before we started exploring. 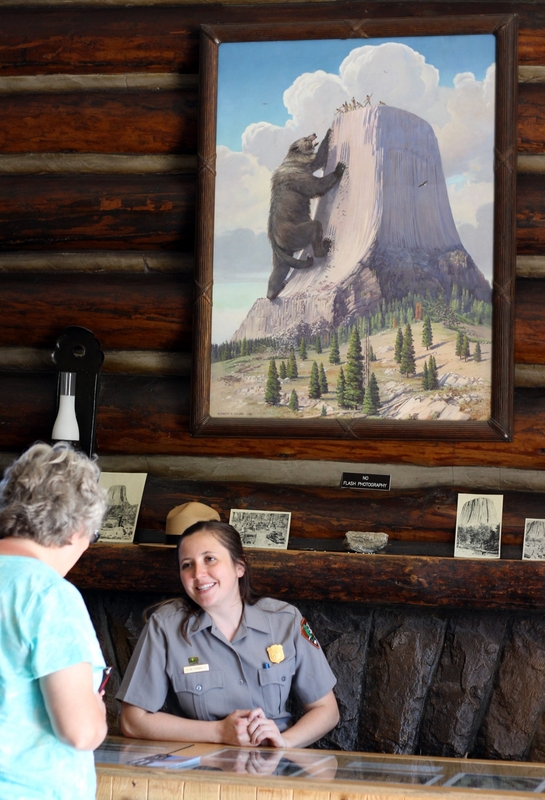 A painting of a huge bear climbing up the side of Devils Tower hangs in the visitors center. This depicts an old legend about the tower. Many moons ago, some girls were out playing in the woodlands when a bear with bad intentions approached. The girls quickly scrambled upon some rocks and began praying to the Great Spirit for safety. Suddenly, the rocks began to rise toward the sky. The bear clawed at the rocks trying to reach its prey. Unsuccessful in this attempt, the bear eventually retreated. The girls were safe upon the top of the new tower, which remains to this day with the deep gashes along the side remaining as a testimony of the bear’s veracity. Most of the original Native American names for the tower include a reference to the bear described in this legend. The present-day name doesn’t denote any legendary dances with the devil. Instead, it’s simply a mistranslation of a tribal name. In recent years, a leader of the Sioux nation has petitioned the government to officially rename the monument Bear Lodge to better reflect its history, but he hasn’t achieved success as of yet. You’ll want to get upclose and personal with this monument and get out to explore the landscape. Rangers at the visitors center can tell you about your options. 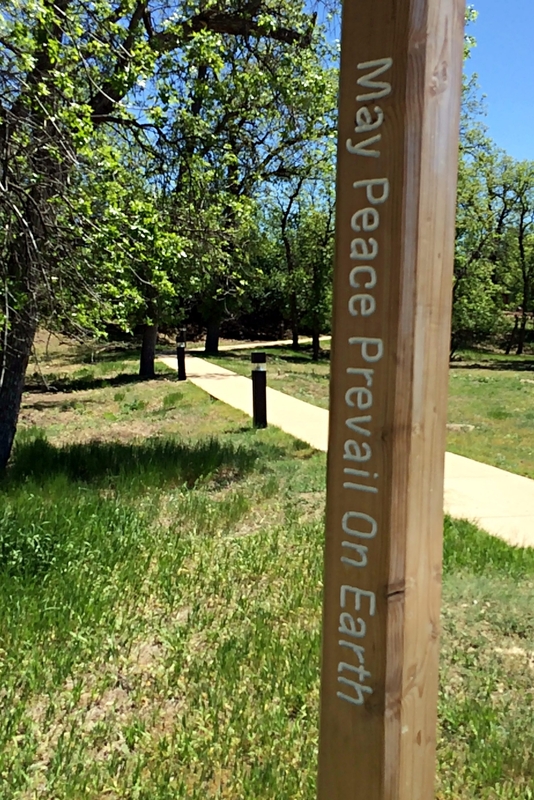 There are four trails, varying in length, difficulty, and scenery. We opted to do the 1.3 mile Tower Trail, which makes a loop around the tower. 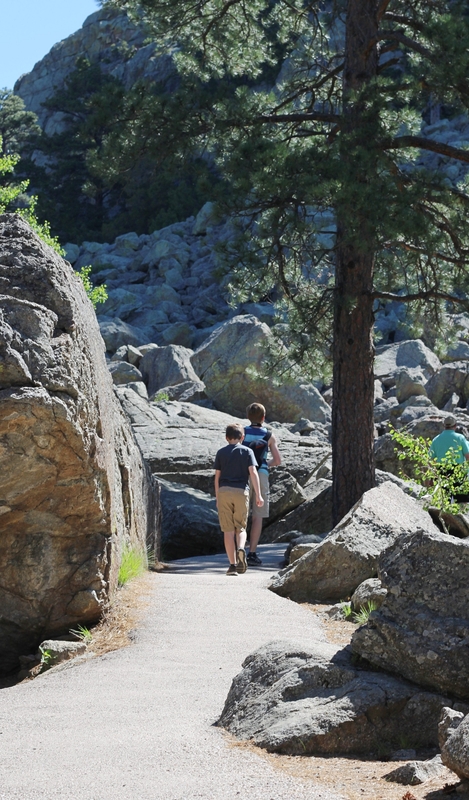 The Tower Trail starts in a boulder field at the base. 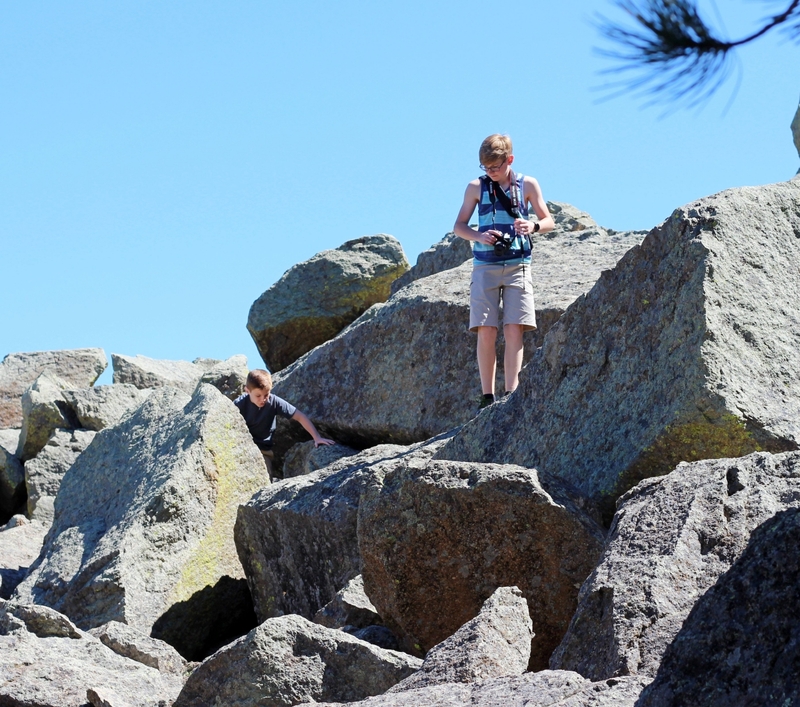 Our boys enjoyed scrambling around the huge rock pile. 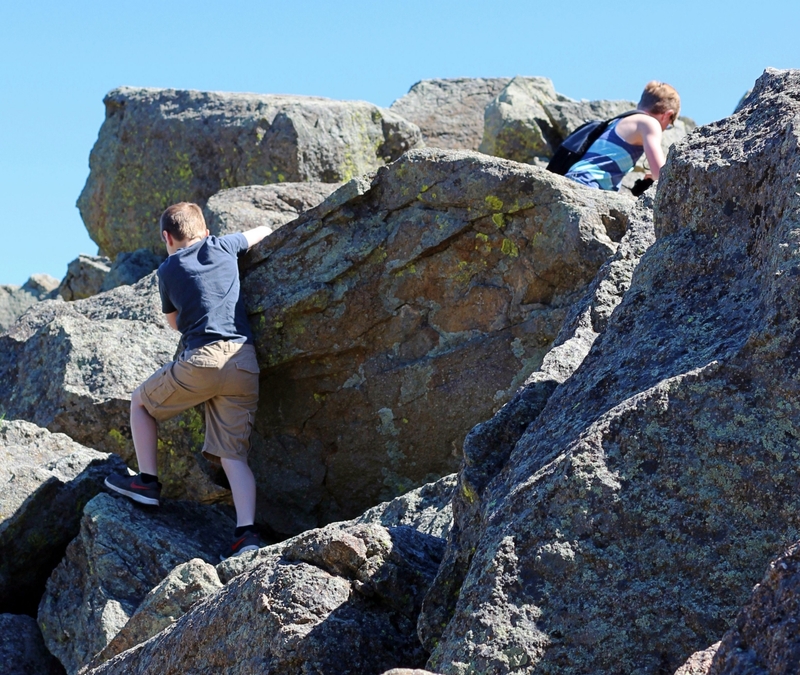 As I’ve mentioned time and again, my younger son doesn’t generally enjoy hiking, but if you throw some giant rocks in front of him, he’s in! After some climbing time, we made our way along the trail. Though it doesn’t seem like it would be impressive looking up at the same tower over and over again, it actually is. The tower seems to change in shape, height, and color, depending on your perspective. We continued to be awed by it. 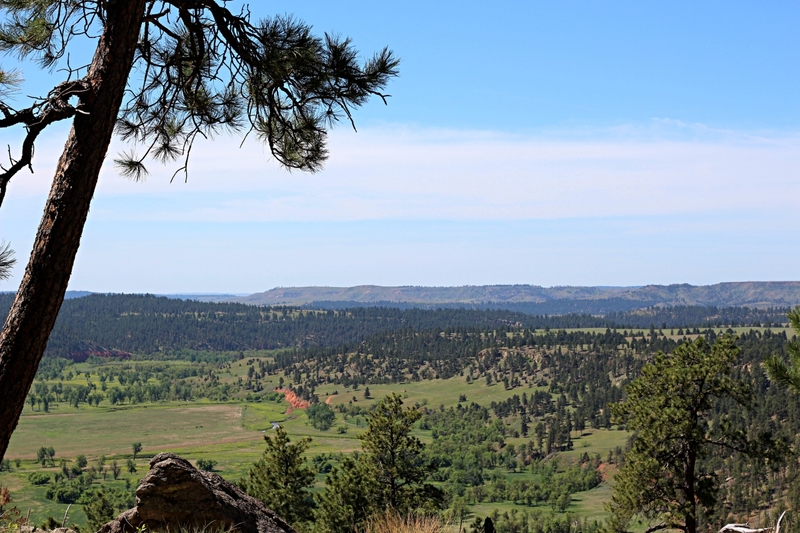 The Tower Trail takes you to an overlook of the scenic Belle Fourche River valley below. The red gash in the earth is where the river runs. As we made our way around the tower, we looked up for rock climbers. 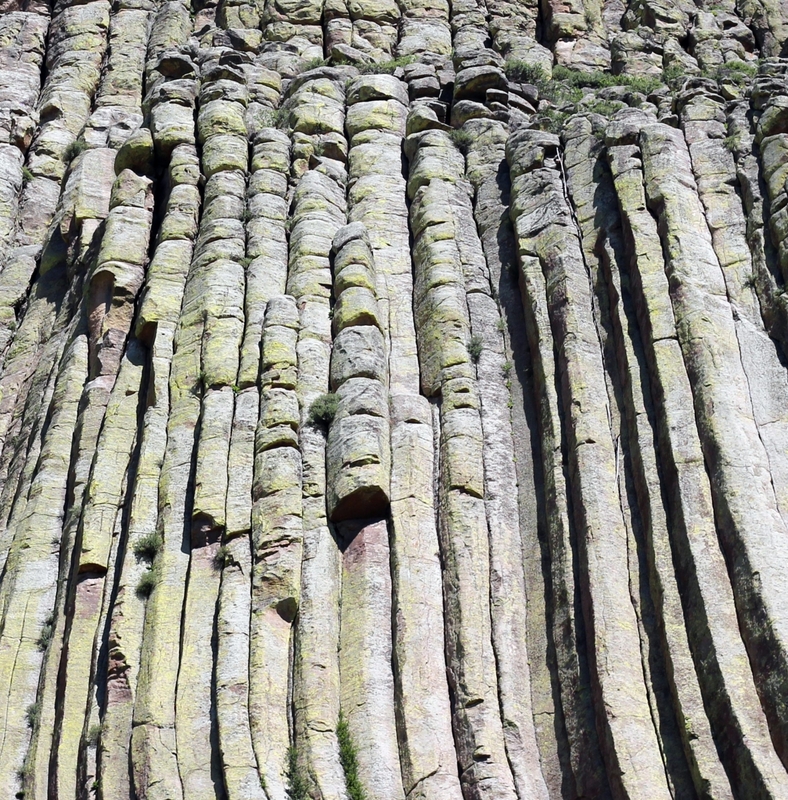 The Devils Tower is a popular climbing spot due to the structure of the cracks along its sides. However, during the month of June, a voluntary climbing restriction is put in place to honor the wishes of Native American tribes who consider the tower a sacred spot, with June being an especially important time of year for ceremonies. Though we did see a handful of climbers, this is not as many as you would find at other times of year. As we walked the trail, we saw prayer cloths and bundles tied in several trees. Visitors are asked to not disturb (or even photograph) these. This national monument is not just an important piece of our national park system, it is a spot revered by many cultures. 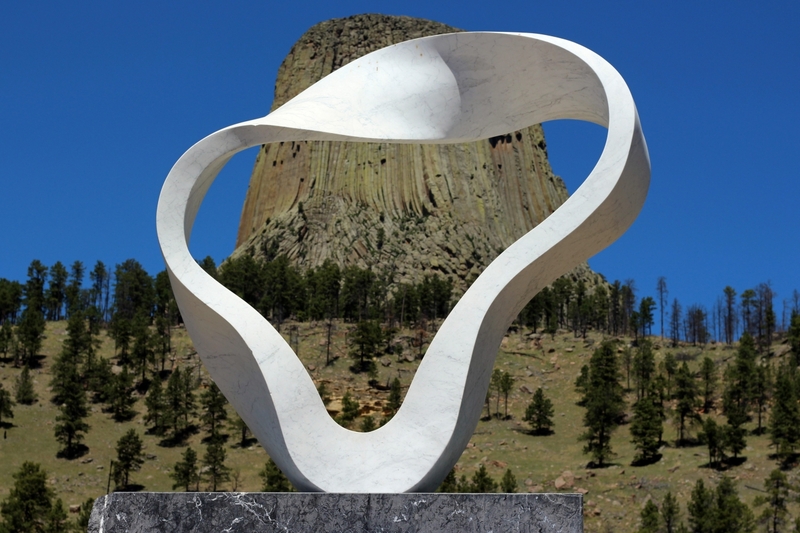 Though the sculpture isn’t huge, it is perfectly placed to beautifully frame the Devils Tower in the distance beyond, making it a must-visit photo spot. The Circle of Sacred Smoke offers a lovely place for reflection. As our family travelled the West, we have encountered many locations where the Native Americans and settlers clashed. America has some of our amazing national parks because we fought tribes to take the land, and we broke treaties and took lands that were promised to them, sadly. This complicated history is left unresolved at many locations. However, the Devils Tower location seems to show sensitivity to this history and to the present-day wishes of Native Americans living in the region. Since we were staying at the KOA just below the entrance to the park, we had easy access for a nighttime visit. 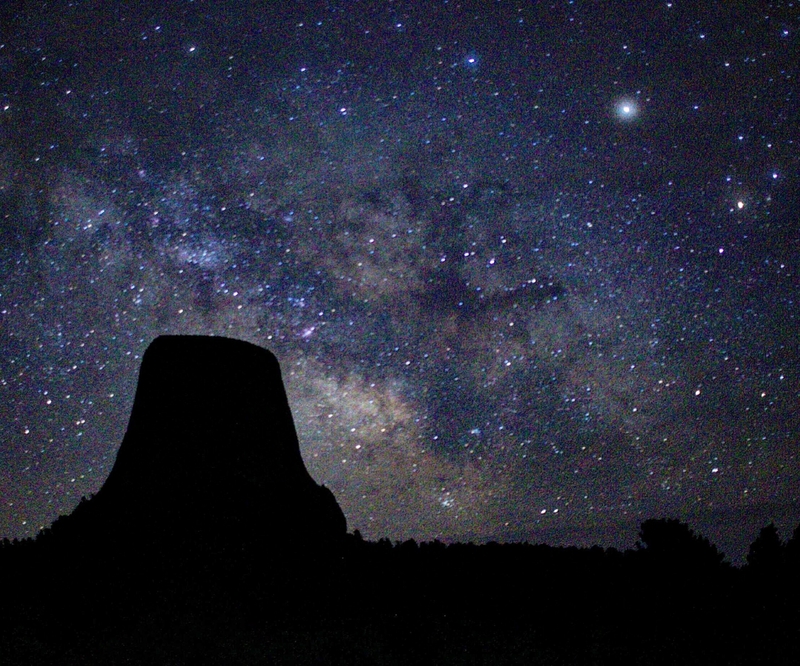 My husband and older son are learning to take night shots, and the Devils Tower offers an iconic focal point for a starry shot. The NPS provides some details about night sky viewing spots on their website. Astronomy programs are also offered, so be sure to check out the program. With low light pollution in the region, this is an excellent place for enjoying a starry night. Our family stumbled upon a similar program last summer at the Grand Canyon, and it ended up being a highlight of our visit. 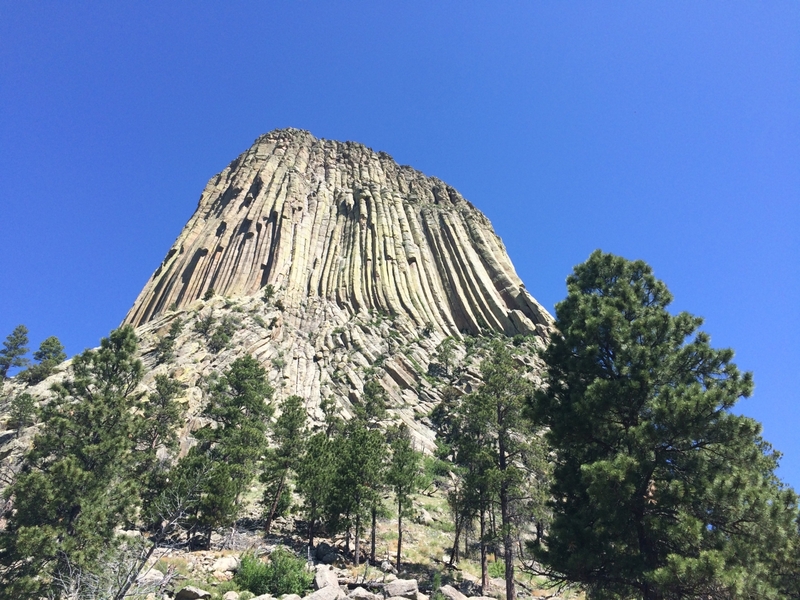 Since the Devils Tower is approximately 45 minutes off the interstate, it is possible to swing by it on your way across Wyoming if your schedule allows for it. However, I highly recommend staying a night or two in the area if you truly want to appreciate this national monument. We enjoyed learning about its history and seeing how the tower changed as the light lit it from different angles throughout the day. Capping our visit off with a nighttime visit to the park added a special memory to our log. It is possible, but not advisable, to do a drive-by visit. You’ll have to allow for the drive 40 minutes north of the interstate, and 40 minutes to return. You’ll probably want to spend a minimum to 2-3 hours in the park. With this timeline in mind, we decided to extend our stay to an overnight visit. We opted to stay two nights, which gave us one full day in the park. The parking lot closest to the base of the tower can fill up midday. Be sure to visit the NPS site to get helpful tips for finding a spot. Do not visit during the second week of August unless you want to enjoy the site and sound of thousands of motorcycles due to the Sturgis Rally. You won’t find much else in this area. You are truly in the backcountry of Wyoming (or, at least, it feels that way). Don’t expect to find big groceries stores or well-known eateries. There are two very nice convenience stores with gift shops and small restaurants. The tiny town of Hulett is approximately 10 miles from the monument. It has some old-timey antique shops and stores, as well as a small grocery store and a couple of local diners. Posted in: Places We've Explored. Tags: BirdyNPS100, National parks, Wyoming. I’m thinking of “A Bear with Bad Intentions” for the title of that novel I’ll get around to writing someday. Or maybe the kids could start a band and call it that. It needs to be the name of something! 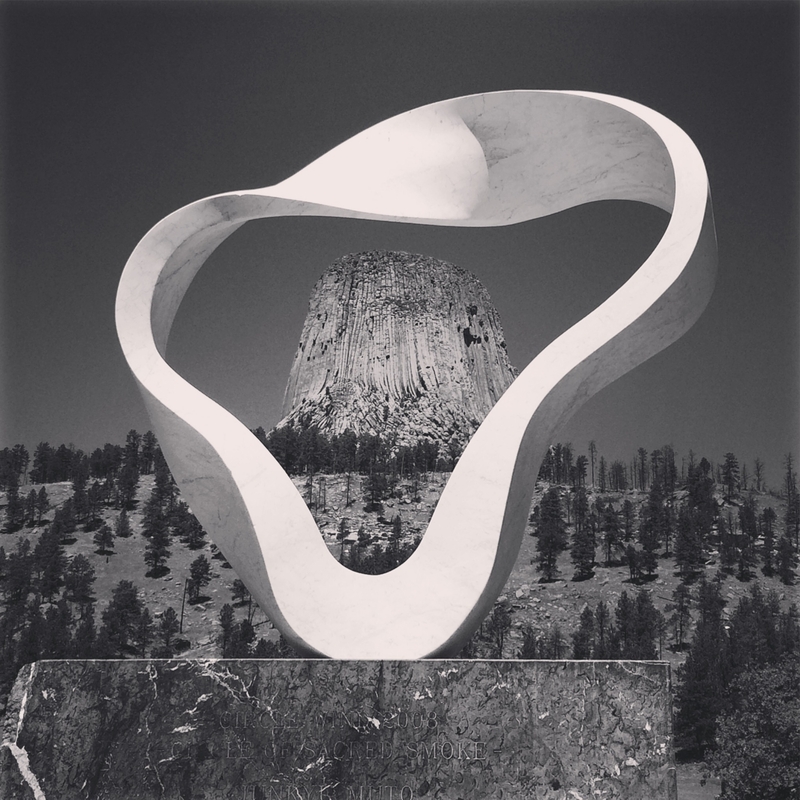 That shot of Devil’s Tower through the sculpture is so gorgeous–my favorite of your trip so far! Ha! You should do it! I’m not sure I literally translated that from the Native Americans. Thank you for the photo compliment! I loved that spot! I hope your family enjoys your visit. Your photos are inspirational and beautiful! Loved the post and all of the backstory. I remember visiting here when I was a little girl and can’t wait to take my children soon. Thank you, Pamela! Thanks for stopping by and check out this post. We are so glad we went to Devils Tower. We were debating whether to go or not, and it was definitely worth the extra miles.